UPDATE! 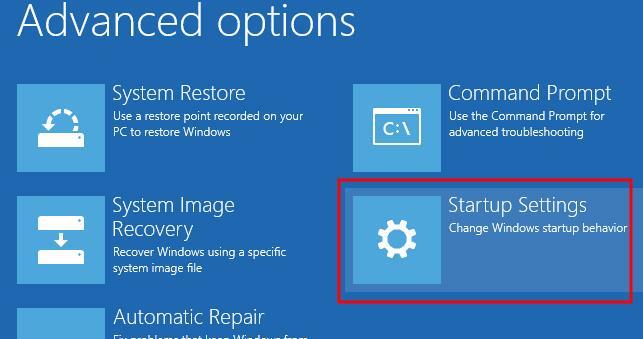 Visit my new blog to find an easy fix with Windows 10 automatically updates your newly tweaked graphics driver. When Windows Auto Updates Your Graphics Driver. Thaddeus added to our ever-expanding bank of knowledge. Thanks, Thaddeus. “For some of the issues mentioned in comments in may be worth noting that following the link you provided to the Intel site only works if they have the exact same driver as you. They have to be able to find the appropriate Media Accelerator Driver and 32 vs 64 on their own before any of it will work. Also for those following VERY literally – the “igdlh” file doesn’t read with the “.inf” extension in Windows 10, the 32 bit simply listed it as “igdlh” but it is the only file that is listed as system info and editable in note pad. We know Java 8 u60 versions or older are causing issues with Minecraft thanks to oghd12345. So possibly other OpenGL games will have issues with these versions of Java. If you need a different version of Java, try the company who produces it (Sun Microsystems) or download.com. With Brian’s help, we now know that Microsoft didn’t feel the need to re-add OpenGL to their new OS release: Windows 10. So sad. But…never fear. 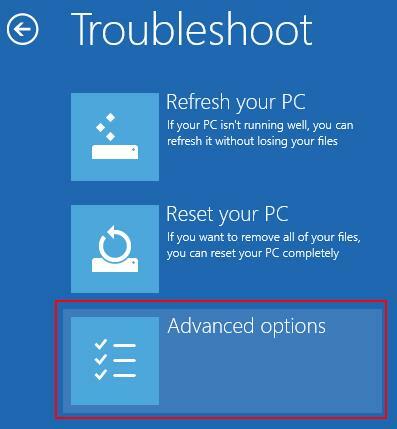 Brian has tried the below fix on Windows 10, and says it works as well on it as on Windows 8. Yippee! Thanks again, Brian. Theo commented he was having issues, but “tried one last thing [to install drivers]. Run it as administrator and also run it in compatibility mode for Windows 7.” It worked for him. Thanks, Theo, for the info. Thanks to prasantahembram for the link (see the comment section below) on disabling driver signature enforcement in Windows 10. The link says Windows 10 Technical Preview, but it’s the same for standard Windows 10. I’ve added the steps below in the Disable Driver Signature Enforcement section. If you are still having issues with this tweak, read the comments below this post; there could be a solution in those for you. I’ve been looking through options and ideas for a year. Yes, an entire year. I like playing Minecraft and installing Windows 8 stopped that in short order. 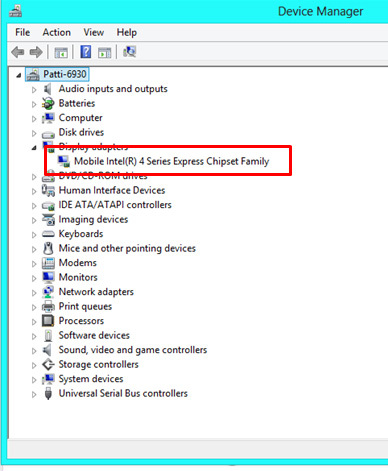 I have Intel Mobile Series 4 Family Chipset drivers (yours are probably different) and Intel is not upgrading them for Windows 8 — thanks, guys (-.-!) — so I’ve been messing with work-arounds. I finally have a solution that actually works and is easy to follow — I’m sure other solutions work, but I had trouble following them as I’m not a computer tech; I only know enough to be dangerous. 3) finally installing your drivers. NOTE: At the end are instructions to disable automatic driver updates. 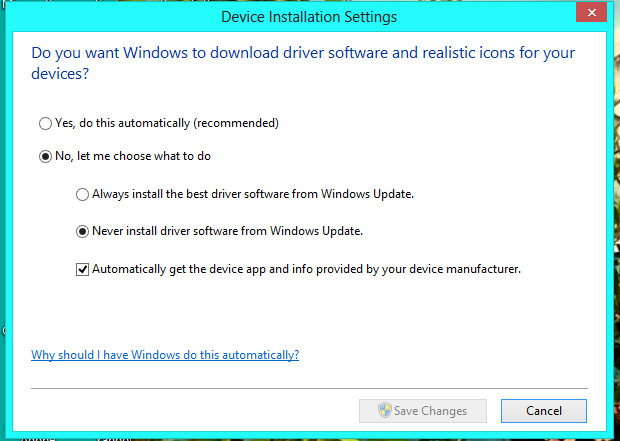 It’s important because if your Windows 8 installs newer drivers, that will undo all the tweaks we’ve just made. It might look complicated, but trust me. it’s only detailed steps that are easy to take. I’ve also been told that it could work—it does—to force Windows 7 drivers to run on Windows 8, but it could cause problems. I haven’t had any, but I caution you to use at your own risk. 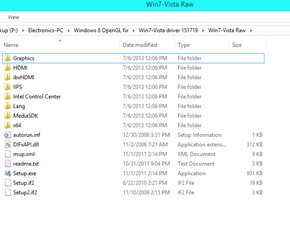 Download Win 7/Vista drivers in .zip format from Intel.com and Save it, don’t open it yet. I used driver version 8.15.10.2555 (151718). Win7/Vista drivers are not all created equal. 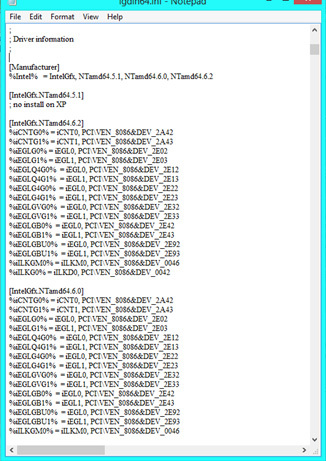 The newest driver on Intel.com (15.17.19.64.2869/ 8.15.10.2869) does not contain a igdlh64.inf file. FYI: You can also download the already unzipped drivers, but this way is much, much easier. There is headache involved with the unzipped as Windows 8 tries immediately to install and you hit a software/hardware incapability block. AUGUST 2014 UPDATE: Thanks to Omar — Thanks, Omar 😀 —here’s the latest info. Under Graphics (step 4 below) use the kit49659.inf instead of the igdlh.inf or igdlh64.inf. I’ve left the older driver information below in case anyone needs it. 2) Choose Extract to… any folder (write down or remember which folder). I use Winzip to unzip my files. 3) Open the folder where you placed your unzipped drivers. It should look something like this. 4) In the Graphics folder, find igdlh64.inf , (or kit49684.inf in driver 8.15.10.2869, or kit 49659 in newer drivers) right click on it and choose to Open with Notepad. 6) Go to File on the top bar and Save. The drivers will not install. 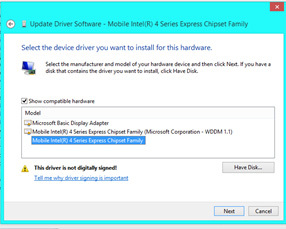 By default, Windows 8 will refuse to install unsigned or modified drivers. Getting the drivers to install requires disabling Driver Signature Enforcement. Now, we need to start Windows in “Disable Driver Signature Enforcement” mode to install our modified driver, otherwise Windows will just block us. NOTE: This section includes Windows 8, 8.1, and 10; scroll to your OS. Theo mentioned having troubles at this step. He then ran install as administrator and in Windows 7 compatibility mode. It worked. Also he didn’t need to do anything special to install the drivers in Windows 10, but reader prasantahembram did so he sent a link on disabling driver signature enforcement in Windows 10, I’ve added his info to the body of the post, but you can find the link in the comment section. 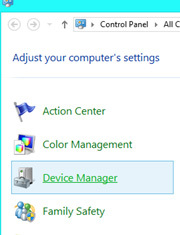 1) Choose the Settings option (gear icon) in Windows 8 by hovering the cursor over the top or bottom right corner of the screen. 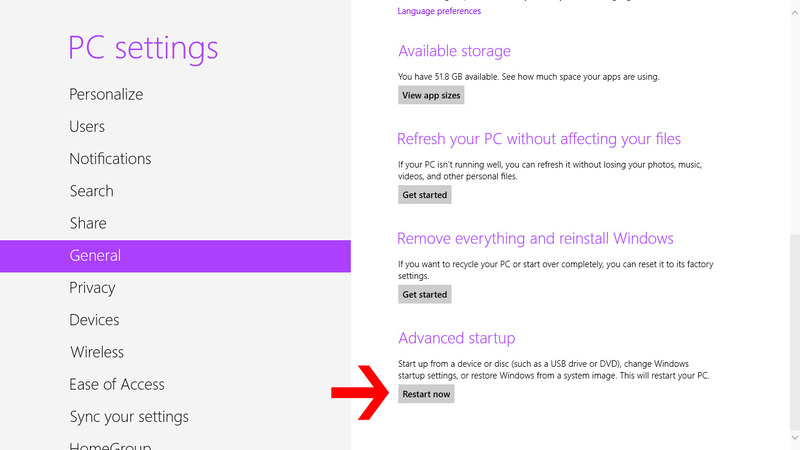 Windows 8.1 and 10 steps differ here (see Step 3a). 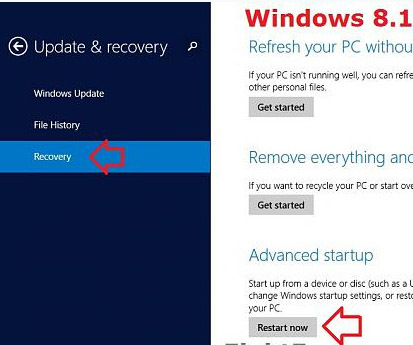 Follow the same steps as Windows 8 until you get through Step 2, then start at 3a. NOTE: Windows 10 is the extremely similar to Windows 8.1. A huge thank you to Eightforums.com for the Windows 8.1 detail. 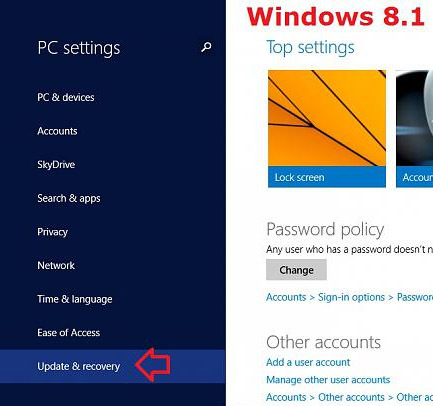 Windows 8, 8.1, and 10 steps are the same now; an alternate Windows 10 is listed below. 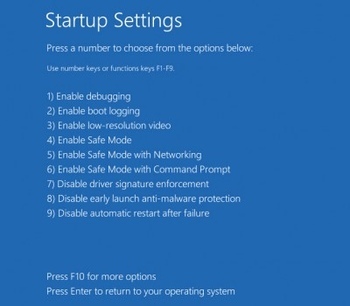 9) Enter to start Windows. There is a significant wait before the next screen appears, my Acer also went to the load screen for a split second. There are a couple ways to do this in Windows 10, but below is listed the easiest one, and we are all about easy. FYI: Windows 10 is almost identical to Windows 8.1 so if you’re a visual person scroll up. 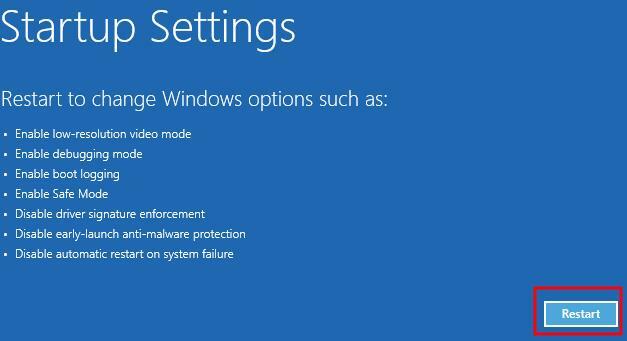 Disable the driver signature enforcement in Windows 10.
b. Click on PC Settings. c. Switch over to the “Update & recovery” section. d. Click the Recovery Option on the left hand side. e. In Advanced Startup section on the right hand side, click on “Restart now”. 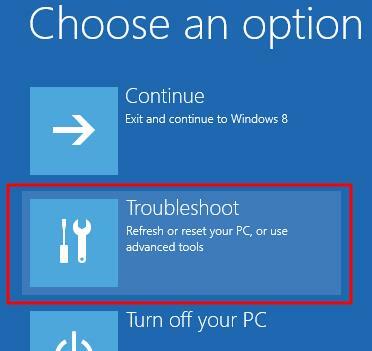 f. Once your Computer has rebooted choose the Troubleshoot option. j. Choose the “Disable driver signature enforcement” option; probably F7 key. Now you should now be able to install the driver needed. 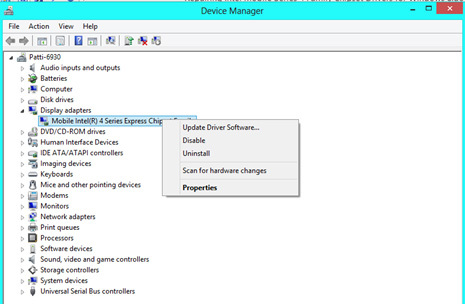 After the driver installs, rebooting will enable driver signature enforcement again. 1) Go to the folder where you saved your modified driver files. 2) Click the Setup.exe file. Several things will happen. The installer will ask if you’re sure you want to download an unsigned driver. You are, so click 3) Download Anyway. 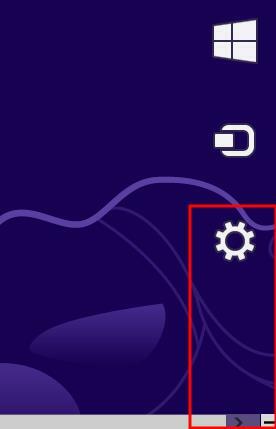 Also the screen will go wonky for a bit during the download. It will return to normal soon. 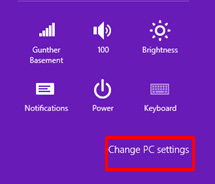 4) After install, hover again over top or bottom right corner and choose the Settings option. 9) Browse my computer for driver software. Now follow the prompts and install the new drivers you just added. FYI: No drivers with WDDM 1.1 will allow OpenGL software. You do this so Windows doesn’t undo the progress you’ve just spent time making. 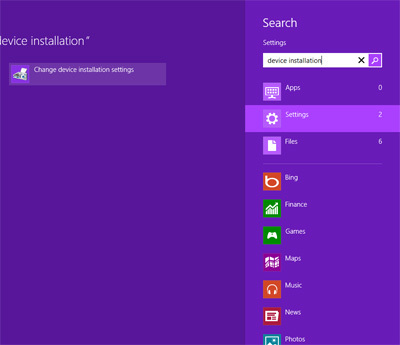 2) Search under Settings “Device installation” and choose to change them. 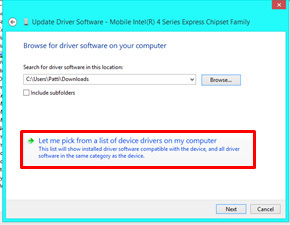 3) Choose to Never install drivers. You’ve done it ! Now start a game that uses OpenGL, like Angrybirds or Minecraft and see how you fare. NOTE: If you have trouble, someone else probably did, too. Don’t forget to read the comments below. We discussed a few problems there. 🙂 Thanks. This entry was posted in Computer Technology and tagged Angrybirds, Minecraft, Minecraft OpenGL error, Mobile Series 4 Family Chipset, Mobile Series 4 Family Chipset Drivers, OpenGL, OpenGl error, Patti's Pathways, pattispathways, Windows 10, Windows 8, Windows 8.1 on July 6, 2013 by Patti. Hehe. That’s why people should read the comments. 😉 Glad it worked for so long for you, Aman. Wanted to run Android emulator so as to use APK on laptop. The work around upgraded system and the OpenGL that this chipset can support will run. Thanks for your info, help and your good work. I’m super glad the info helped! Aurelius sent a blog link, and it’s basically the same thing I have, but in case you can’t follow mine, I’m approving the comment as you may be able to follow Aurelius’s instructions. I’ve opened the blog and so far haven’t had any problems with viruses, bugs, etc. 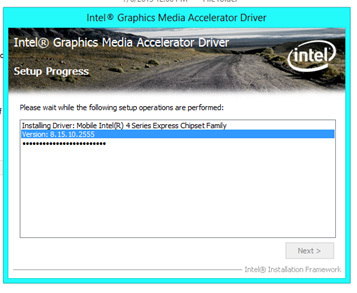 I’m having trouble at the “Installing Downloaded Drivers” part. I go to the folder where I saved my files and start up the Setup thing. After, it says “Please install the latest version of Microsoft .NET Framework from Microsoft Download Center to run this application correctly. Are you sure you want to continue?” I installed the Microsoft.NET from their website, and after that message, another pops up saying “This computer does not meet the minimum requirements for installing the software.” I’m at a loss at this point. Don’t install the driver. You just want pieces of the driver, not the entire thing. Reread my post slowly and you’ll see what I’m talking about. If you still are stuck, read the comment section; lots of great information there. It will work if you follow the steps exactly. i’m having the same issue. In step 3.2 you ask us to click on Setup.exe to install, but now you say we shouldnt install it. Hi Japhola, In Step 1 you can’t install the tweaked drivers because Windows will stop you. 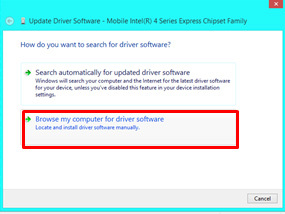 In Step 3, you can now install the drivers you’ve tweaked because Step 2 (which I will rename to lessen confusion) shows you how to disable the Windows Driver Signature Enforcement which prevents installing the tweaked drivers. Hope that helps, and thanks for following! Thanks, prasantahembram. 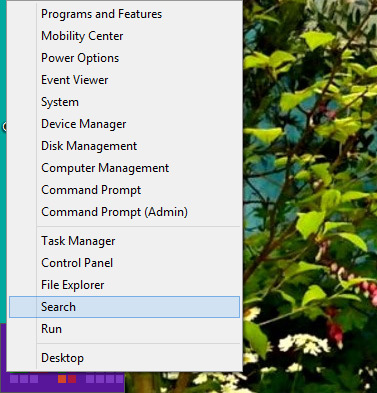 In my blog I listed the steps for Window 10, which are very similar to Windows 8.1; glad nothing changed drastically. looking at this a year later, and using this to help a friend. and By the way, I am oghd12345, I just got my wordpress account synced with my blog! This is solution for my old Dell Latitude E5400 with Windows 8.1 to play minecraft. Opengl problem solved. Thank you very much, success for you. You should be able to use the 32-bit igdlh file for your specific graphics chip the same way as 64-bit. You don’t want to install the driver. You want to save the driver as a .zip file, then open the .zip driver file in Notepad or similar program, and do the copy and paste of the lines in the driver file. If you let Windows try to install the driver, you’ll get error messages about your system not meeting specifications. Read the other comments; there is information in them about installation errors and about 32-bit. Thanks for the info. Your work triggered me to do something for my 965 and 945 chipset opengl issue, I finally got them work by just installing windows 7 version driver 8.15.10.1930 for both chipsets using the igdlh.inf in 8.15.10.1930. Actually the vista version also worked. I didnt have to do any cut and paste, I just upgraded the driver through device manager. Now I can play call of duty 1 on my two very old thinkpads x61t and x60 running windows 10 pro. Hey! That’s awesome. I’m so glad I could help… in a roundabout way. And thanks for sharing the info. Maybe it’ll trigger thoughts for others. Thanks, I was tired of trying every setting did to Support opengl and search a lot but at last I found your tweaking and did the same. Hurray, 😄 mine craft works again, virtual box works again. Thanks a lot for making this page. Thanks for the comment, Roy. I’m really glad this worked for you. Thanks for sharing where you found the files for a G41 Express Chipset.